Tips for conquering email overload at work. It’s the end of a three day holiday weekend and as you sit down at your desk you experience that familiar overwhelming feeling. You are not dreading the day or week ahead – you are dreading your inbox! If you receive at least 30 to 50 emails every day, reading and responding to all of this mail takes a long time – most of your “real” work takes a back seat to this daily chore. As a result, you get behind on projects and start working late just to catch up. 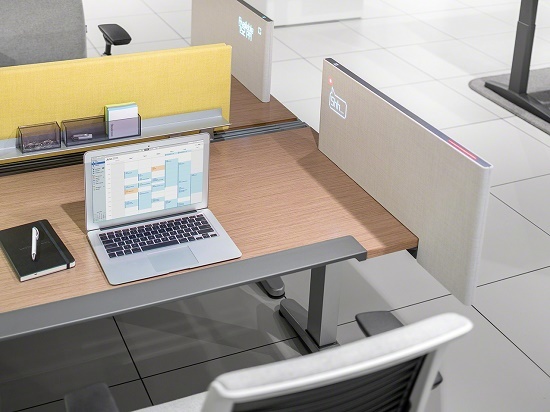 IMAGE: Steelcase’s new Ology height-adjustable tables. When used appropriately, email is an incredible communication tool. But, when we feel overwhelmed by the amount of email that we receive and need to respond to, the tool becomes our worst enemy. However, there are ways to manage email overload at work so that you’re more productive. I hope these very simple tips help you feel more productive! The constant interruption and distraction that comes from checking your email constantly can dramatically lower your productivity and disrupt your ability to focus on important tasks. One strategy you can use is to check email only at set points during the day. For instance, you may decide that you’ll only check your email first thing in the morning, before lunch, and at the end of the day. Explain to your colleagues, boss, or clients that you only check email at certain times and recommend that they call you or use IM or text if the matter is really urgent. When reading email, you can waste precious time if you’re not effective. Try using the “quick rule”. If the email takes less than two minutes to read and reply to, then take care of it right away (even if it’s not a high priority). The idea is that if it takes less than two minutes to complete the read/respond action then it’ll be more productive than reading the email, storing the task away, remembering it, and replying to it later on. For emails that take longer than two minutes to read or respond to, schedule time on your calendar, or add this as an action on your to do list. Most email programs allow you to highlight, flag, or star messages that need a response, so utilize this handy feature whenever you can. Can you imagine having an inbox with nothing in it? It almost sounds too good to be true. Although achieving “inbox zero” might be unrealistic for many of us, keeping our main inbox cleared can keep us organized and help eliminate stress. First, set up a simple filing system to help manage your mail. You could use broad categories titled “Action Items,” “Waiting,” “Reference,” and “Archives.” If you’re able to stay on top of your folders – particularly “Action” and “Waiting” folders – you could use them as an informal To-Do List for the day. One of the best things that you can do to limit the amount of email you need to process is to encourage people to send you less and whenever possible do not “reply all”. For instance, if certain team members regularly send you long, drawn-out emails, let them know. Tell them gently but firmly that because of the demand on your time you’d appreciate emails no longer than a paragraph or two. Anything longer should warrant a phone call. Alternatively, they could drop by your desk/office for a discussion. As we step back into the busy season, I hope these few tips on conquering email overload at work will help you stay focused and productive! Boost employee engagement by connecting people + purpose. 10 Design tips to refresh your mind from Coalesse.